It’s summertime, it’s hot and you’ve been looking forward to treating yourself to your favorite ice cream all week long. You go to your favorite ice cream shop at Reston Town Center and order two scoops, one with chocolate and the other with coffee. Yum! As you dig into your first bite you wince and feel a surge of pain in your mouth. What was meant to be a treat has turned into a nightmare. 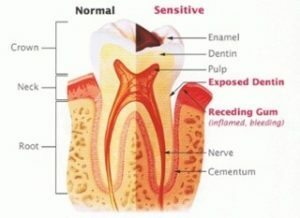 So What Causes Tooth Sensitivty? Sadly, tooth sensitivity or dentin hypersensitivity is a common dental problem and can develop over time. Whether you need an in-office procedure or over-the-counter products, the most important step is to contact us in order for us to determine the cause of the tooth sensitivity and help you find a solution.